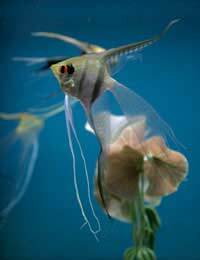 One of the most splendid of all tropical aquarium inhabitants is the angel fish. This is a popular opinion when people first consider keeping tropical fish. Though they can be fragile when small they grow up to be relatively hardy fish and, with proper care, should thrive in your aquarium. Growing to about a foot in height, angel fish need plenty of space, so make sure your aquarium is big enough for them. They should be kept singly or in shoals of four or more, as smaller groups will result in dominance battles and bullying. As they are by nature predatory you should avoid keeping them with small fish like guppies and neon tetra, but otherwise they get along well in community tanks. However, if you want to breed your angel fish, you are likely to have more success if you separate them. They can be aggressive in defence of their young and may then represent a danger to other fish. Due to their unusual shape, angel fish often struggle to move around in aquariums with strong water flow, so relatively still water is recommended. They are generally happy in gravel bottomed tanks but should be given a bare bottomed tank for breeding. It is important to make sure that the bottom of the tank is a dark colour and that the tank has a background picture, as this will make your angel fish feel more secure. You will probably hear other aquarists talking about marine angel fish, but these are not true angel fish, which are members of the cichlid family. True angel fish live in fresh water, usually at about 26ºc. There are several varieties suitable for aquariums. Silver - These are the most popular angel fish, with vertically striped black and white bodies. They are comparatively hardy and adaptable. Black Lace -These look similar to silver angel fish but have a lace-like pattern on their fins. Black -Solid velvety black in colour, these striking fish are more delicate than their kin, especially when young. Pearl Scale -These fish have distinctive bumpy scales which give them a striking texture, and have variable colours. Blushing -These distinctive fish have red cheeks on white bodies. They can be delicate and are vulnerable to disease in community tanks. Veiltail -Available in a range of colours, these fish have very long, trailing fins. They can be fragile and are vulnerable to nipping by other fish. Angel fish are omnivorous but do best on a diet which contains plenty of meat. Variety is important. They will happily accept flake food but also benefit from freeze dried foods like brine shrimp, bloodworm, tubifex and plankton. Some aquarists recommend giving them a weekly treat of black worms. Live food should only be provided if it is from a reliable source, as angel fish can be particularly vulnerable to parasites which can be introduced in this manner. Angel fish are comparatively easy to breed. However, it can be difficult (even for experts) to tell males from females, so your best bet is to watch them closely and let them pair off naturally. They are more likely to breed if they have good water quality and plenty of space. They will carefully prepare a spawning site (usually a clean, flat surface) and will guard their fry after hatching. It is important to protect them from stress at this stage so that they don't panic and eat their young. For this reason, they should be given as much privacy as possible. Striking to look at and fascinating in their habits, angel fish make a fine addition to the tropical aquarium and are a choice you won't regret. hi i have two blushing angels in a community tank, eggs have appeared on a piece of slate and the pair af angels are fanning and protecting the eggs. i noticed this morning that some of the eggs are turning white, is this because the eggs are fertilised or are they dead ? I have a three foot tank with a dolphin nose, 1 dwarf garrami and 5 small black widow along with a silver anglefish. My anglefish has grown quiet large but the last week he is unable to swim and just lies on his side which is slowly damaging his side fins ( arms?) I have had him in a seperate tank for the fast week and added some sulphur tablets recommended by my local petstock store. I have given him two lots of a quater tablet over the week and he will swim for five seconds to feed, he's a fighter & supprised he's still alive. Is there any more I can do as I dont see any change? My water is good, the pet sore has tested both tanks.